Not to be confused with Cordaites, the extinct tree. Cordite is a family of smokeless propellants developed and produced in the United Kingdom since 1889 to replace gunpowder as a military propellant. Like gunpowder, cordite is classified as a low explosive because of its slow burning rates and consequently low brisance. These produce a subsonic deflagration wave rather than the supersonic detonation wave produced by brisants, or high explosives. The hot gases produced by burning gunpowder or cordite generate sufficient pressure to propel a bullet or shell to its target, but not so quickly as to routinely destroy the barrel of the gun. Cordite was used initially in the .303 British, Mark I and II, standard rifle cartridge between 1891 and 1915; shortages of cordite in World War I led to United States–developed smokeless powders being imported into the UK for use in rifle cartridges. Cordite was also used for large weapons, such as tank guns, artillery and naval guns. It has been used mainly for this purpose since the late 19th century by the UK and British Commonwealth countries. Its use was further developed before World War II, and as 2-and-3-inch-diameter (51 and 76 mm) Unrotated Projectiles for launching anti-aircraft weapons. Small cordite rocket charges were also developed for ejector seats made by the Martin-Baker Company. Cordite was also used in the detonation system of the Little Boy atomic bomb dropped over Hiroshima in August 1945. The term "cordite" generally disappeared from official publications between the wars. During World War II double based propellants were very widely used and there was some use of triple based propellants by artillery. Triple based propellants were used in post-war ammunition designs and remain in production for UK weapons; most double based propellants left service as World War II stocks were expended after the war. For small arms it has been replaced by other propellants, such as the Improved Military Rifle (IMR) line of extruded powder or the WC844 ball propellant currently in use in the 5.56×45mm NATO. Production ceased in the United Kingdom, around the end of the 20th century, with the closure of the last of the World War II cordite factories, ROF Bishopton. Triple base propellant for UK service (for example, the 105 mm L118 Light Gun) is now manufactured in Germany. Gunpowder, an explosive mixture of sulfur, charcoal and potassium nitrate (also known as saltpetre), was the original propellant employed in firearms and fireworks. It was used from about the 10th or 11th century onwards, but it had disadvantages, including the large quantity of smoke it produced. With the 19th-century development of various "nitro explosives", based on the reaction of nitric acid mixtures on materials such as cellulose and glycerine, a search began for a replacement for gunpowder. The first smokeless powder was developed in 1865 by Major Johann F. E. Schultze of the Prussian artillery. His formulation (dubbed Schultze Powder) was composed of nitrolignose impregnated with saltpetre or barium nitrate. In 1882 the Explosive Company of Stowmarket introduced EC Powder', which contained nitro-cotton and nitrates of potassium and barium in a grain gelatinesed by ether alcohol. It had coarser grains than other nitrocellulose powders. It proved unsuitable for rifles, but it remained in long use for shotguns and was later used for grenades and fragmentation bombs. In 1884, the French chemist Paul Vieille produced a smokeless propellant that had some success. It was made out of collodion (nitrocellulose dissolved in ethanol and ether), resulting in a plastic colloidal substance which was rolled into very thin sheets, then dried and cut up into small flakes. It was immediately adopted by the French military for their Mle 1886 infantry rifle and called Poudre B (for poudre blanche, or white powder) to distinguish it from black powder (gunpowder). The rifle and the cartridge developed to use this powder were known generically as the 8mm Lebel, after the officer who developed its 8 mm full metal jacket bullet. The following year, 1887, Alfred Nobel invented and patented a smokeless propellant he called Ballistite. It was composed of 10% camphor, 45% nitroglycerine and 45% collodion (nitrocellulose). Over time the camphor tended to evaporate, leaving an unstable explosive. A United Kingdom government committee, known as the "Explosives Committee", chaired by Sir Frederick Abel, monitored foreign developments in explosives and obtained samples of Poudre B and Ballistite; neither of these smokeless powders was recommended for adoption by the Explosives Committee. Abel, Sir James Dewar and W Kellner, who was also on the committee, developed and jointly patented (Nos 5,614 and 11,664 in the names of Abel and Dewar) in 1889 a new ballistite-like propellant consisting of 58% nitroglycerine, by weight, 37% guncotton (nitrocellulose) and 5% petroleum jelly. Using acetone as a solvent, it was extruded as spaghetti-like rods initially called "cord powder" or "the Committee's modification of Ballistite", but this was swiftly abbreviated to "Cordite". Cordite began as a double-base propellant. In the 1930s triple-base was developed by including a substantial proportion of nitroguanidine. Triple-based propellant reduced the disadvantages of double-base propellant - its relatively high temperature and significant flash. Imperial Chemical Industries's (ICI) World War 2 double-base AN formulation also had a much lower temperature, but it lacked the flash reduction properties of N and NQ triple-base propellants. Whilst cordite is classified as an explosive, it is not employed as a high explosive. It is designed to deflagrate, or burn, to produce high pressure gases. It was quickly discovered that the rate of burning could be varied by altering the surface area of the cordite. Narrow rods were used in small-arms and were relatively fast burning, while thicker rods would burn more slowly and were used for longer barrels, such as those used in artillery and naval guns. The original Abel-Dewar formulation was soon superseded, as it caused excessive gun barrel erosion. It has since become known as Cordite Mk I. The composition of cordite was changed to 65% guncotton and 30% nitroglycerine (keeping 5% petroleum jelly) shortly after the end of the Second Boer War. This was known as Cordite MD (modified). Cordite MD cartridges typically weighed approximately 15% more than the cordite Mk I cartridges they replaced, to achieve the same muzzle velocity, due to the inherently less powerful nature of Cordite MD. During World War I acetone was in short supply in Great Britain, and a new experimental form was developed for use by the Royal Navy. This was Cordite RDB (= Research Department formula B); which was 52% collodion, 42% nitroglycerine and 6% petroleum jelly. It was produced at HM Factory, Gretna; and the Royal Navy Cordite Factory, Holton Heath. Acetone for the cordite industry during late World War I was eventually produced through the efforts of Dr. Chaim Weizmann, considered to be the father of industrial fermentation. While a lecturer at Manchester University Weizmann discovered how to use bacterial fermentation to produce large quantities of many desired substances. He used the bacterium Clostridium acetobutylicum (the so-called Weizmann organism) to produce acetone. Weizmann transferred the rights to the manufacture of acetone to the Commercial Solvents Corporation in exchange for royalties. After the Shell Crisis of 1915 during World War I, he was director of the British Admiralty Laboratories from 1916 until 1919. Cordite RDB was later found to become unstable if stored too long. Research on solvent-free Cordite RDB continued primarily on the addition of stabilizers, which led to the type commonly used in World War II as the main naval propellant. In Great Britain this was known as Cordite SC (= Solventless Cordite). Cordite SC was produced in different shapes and sizes, so the particular geometry of Cordite SC was indicated by the use of letters or numbers, or both, after the SC. For example, SC followed by a number was rod-shaped cord, with the number representing the diameter in thousandths of an inch. "SC T" followed by two sets of numbers indicated tubular propellant, with the numbers representing the two diameters in thousandths. Two-inch (approximately 50 mm) and three-inch (approximately 75 mm) diameter, rocket Cordite SC charges were developed in great secrecy before World War II for anti-aircraft purposes—the so-called Z batteries, using 'Unrotated Projectiles'. Great Britain changed to metric units in the 1960s, so there was a discontinuity in the propellant geometry numbering system. An important development during World War II was the addition of another explosive, nitroguanidine, to the mixture to form triple-base propellant or Cordite N and NQ. The formulations were slightly different for artillery and naval use. This solved two problems associated with the large naval guns fitted to British Navy's capital ships: gun flash and muzzle erosion. Nitroguanidine produces large amounts of nitrogen when heated, which had the benefit of reducing the muzzle flash, and its lower burning temperature greatly reduced the erosion of the gun barrel. N and NQ were also issued in limited amounts to ammunitions used by the British 25-pdr and 5.5-inch land-based artillery pieces. After World War II production of double based propellants generally ended. Triple based propellants, N and NQ, were the only ones used in new ammunition designs, such as the cartridges for 105 mm Field and for 155 mm FH70. In Great Britain cordite was developed for military use at the Royal Arsenal by Abel, Dewar and Kellner, Woolwich, and produced at the Waltham Abbey Royal Gunpowder Mills from 1889 onwards. At the start of World War I cordite was in production at Waltham Abbey Royal Gunpowder Mills and by seven other suppliers (British Explosives Syndicate Ltd, Chilworth Gunpowder Company Ltd, Cotton Powder Company Ltd, Messrs Curtis's and Harvey Ltd, National Explosives Company Ltd, New Explosives Company Ltd and Nobels Explosive Company Ltd). . Existing factories were expanded and new ones built notably by Nobel's at Ardeer, HM Factory, Gretna, which straddled the Scotland-England border at Gretna, and the Royal Navy Cordite Factory, Holton Heath . A factory was also established by the Indian Government at Nilgris. Both the Gretna and the Holton Heath cordite factories closed at the end of World War I. By the start of World War II Holton Heath had reopened, and an additional factory for the Royal Navy, The Royal Navy Propellant Factory, Caerwent, opened at Caerwent in Wales. A very large Royal Ordnance Factory, ROF Bishopton, was opened in Scotland to manufacture cordite for the British Army and the Royal Air Force. A new cordite factory at Waltham Abbey and two additional ROF's—ROF Ranskill and ROF Wrexham—were also opened. Cordite produced in these factories was sent to filling factories for filling into ammunition. The British Government set up additional cordite factories, not under Royal Ordnance Factory control but as Agency Factories run on behalf of the Ministry of Supply (MoS). The company of ICI Nobel, at Ardeer, was asked in 1939 to construct and operate six factories in southern Scotland. Four of these six were involved in cordite or firearm-propellant manufacture. The works at MoS Drungans (Dumfries) produced guncotton that was converted to cordite at MoS Dalbeattie (triple-base cordite) and at MoS Powfoot (monobase granulated guncotton for small-arms). A smaller site at Girvan, South Ayrshire, now occupied by Grant's distillery, produced cordite and TNT. The ICI Ardeer site also had a mothballed World War I Government-owned cordite factory. 35% of British cordite produced between 1942 and 1945 came from Ardeer and these agency factories. ICI ran a similar works at Deer Park near Melbourne in Australia and in South Africa. Additional sources of propellant were also sought from the British Commonwealth in both World War I and World War II. Canada, South Africa, and Australia had ICI-owned factories that, in particular, supplied large quantities of cordite. Canadian Explosives Limited was formed in 1910 to produce rifle cordite, at its Beloeil factory, for the Quebec Arsenal. By November 1915 production had been expanded to produce 350,000 lb (159,000 kg) of cordite per month for the Imperial Munitions Board. The Imperial Munitions Board set up a number of additional explosives factories in Canada. It built The British Cordite Ltd factory at Nobel, Ontario, in 1916/1917, to produce cordite. Production started in mid-1917. Canadian Explosives Limited built an additional cordite factory at Nobel, Ontario. Work started in February 1918 and was finished on 24 August 1918. It was designed to produce 1,500,000 lb (681,000 kg) of cordite per month. Factories, specifically “heavy industry” (Long, and Marland 2009) were important for the provision of munitions. Cordite factories typically employed women (Cook 2006) who put their lives at risk as they packed the shells. Large quantities of cordite were manufactured in both World Wars for use by the military. Prior to World War I, most of the cordite used by the British Government was produced in its own factories. Immediately prior to World War I, between 6,000 and 8,000 tons per year of cordite were produced in the United Kingdom by private manufacturers; between 1,000 and 1,500 tons per year were made by Nobel's Explosives, at Ardeer. However, private industry had the capability to produce about 10,000 tons per year, with Ardeer able to produce some 3,000 tons of this total. At the start of World War I, private industry in the UK was asked to produce 16,000 tons of cordite, and all the companies started to expand. HM Factory, Gretna, the largest propellant factory in the United Kingdom, which opened in 1916, was by 1917 producing 800 tons (812 tonne) of Cordite RDB per week (approximately 41,600 tons per year). The Royal Navy had its own factory at Holton Heath. In 1910, Canadian Explosives Limited produced 3,000 lb (1,362 kg) of rifle cordite per month at its Beloeil factory, for the Quebec Arsenal. By November 1915 production had been expanded to 350,000 lb (159,000 kg) of cordite per month (approximately 1,900 tonnes per year). The Canadian Explosives Limited cordite factory at Nobel, Ontario was designed to produce 1,500,000 lb (681 tonne) of cordite per month (approximately 8,170 tonnes per year). HM Factory, Gretna and the Royal Navy Cordite Factory, Holton Heath both closed after the end of the war and the Gretna factory was dismantled. This left the Waltham Abbey and Ardeer factories in production. In honour of the military uses of cordite, the Royal Military College of Canada's mechanical engineering department built a ship for use in thermodynamic research, and named it MV Cordite. 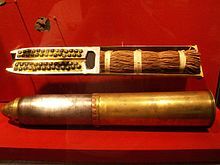 Cordite rather than the more general term "gunpowder", which includes several explosive propellants, appears to have been overused by writers of gun battles. ^ a b Schuck & Sohlman 1929, Appendix I: Alfred Nobel's English lawsuit. Mr justice Romer's judgment in the "Cordite Case"
^ Example : BL 6-inch Mk VII gun : 20 lb cordite Mk I, 23 lb cordite MD. Table 8 in Treatise on Ammunition 1915. ^ a b c d e Reader 1975, Chapter 14: "Warlike Supply"
^ a b Reader 1975, Chapter 15: "War Production"
^ a b c d Carnegie (1925). Bowditch, M.R. ; Hayward, L. (1996). A Pictorial record of the Royal Naval Cordite Factory: Holton Heath. Wareham:: Finial Publishing. ISBN 1-900467-01-1. Brown, Donald (1999). Somerset v Hitler: Secret Operations in the Mendips 1939 - 1945. Newbury: Countryside Books. ISBN 1-85306-590-0. Carnegie, David (1925). The History of Munitions Supply in Canada 1914-1918. London: Longmans, Green and Co.
Cocroft, Wayne D. (2000). Dangerous Energy: The archaeology of gunpowder and military explosives manufacture. Swindon: English Heritage. ISBN 1-85074-718-0. Davis, Tenney L. (1943). The Chemistry of Powder and Explosives. Volume II. New York: John Wiley & Sons. Hartcup, Guy (1970). The Challenge of War: Scientific and Engineering Contributions to World War Two. Newton Abbot:: David & Charles. ISBN 0-7153-4789-6. Hogg, O.F.G. (1970). Artillery: its origin, heyday and decline. London: C Hurst and Company. Ministry of Munitions (1922). The Official History of the Ministry of Munitions Volume X The Supply of Munitions Part IV Gun Ammunition: Explosives. Reader, W.J. (1975). Imperial Chemical Industries: A History. Volume II; The First Quarter-Century 1926-1952. London: Oxford University Press. ISBN 0-19-215944-5. Schuck, H.; Sohlman, R. (1929). The Life of Alfred Nobel. London: William Heinemann. Ministry of Munitions of War (1919). H.M. Factory, Gretna: Description of plant and process. Dumfries: J. Maxwell and Son, for His Majesty's Stationery Office. Rotter, Andrew J. (2008). Hiroshima: The World's Bomb. Oxford: Oxford University Press. ISBN 0-19-280437-5. Zukas, John A.; Walters, William P. (2002). Explosives, Effects and Applications. Springer. Wikimedia Commons has media related to Cordite.